The Nikon D70s is an evolution of the award winning Nikon D70. It inherits the image quality, high performance and user-friendliness of the D70 and adds features such as a large 2.0-inch LCD monitor and new high-energy rechargeable lithium-ion battery EN-EL3a. The 6.1 effective megapixel Nikon DX Format CCD image sensor features a wide dynamic range and a high signal to noise ratio which produces 3008 x 2000-pixel images with high resolution and sharp detail suitable for making large prints or cropping for creative detail. The D70s is ready to shoot in an instant, taking just 0.2 seconds to power up. Shutter release time lag is minimised for quick response which makes shooting even more efficient. The D70s is capable of shooting a rapid 3 frames per second for a continuous burst of 144 pictures. Shutter speeds of 30 to 1/8,000 sec. ensure full creative control. The built-in auto pop-up flash can synchronize at shutter speeds of up to 1/500 sec. for great fill flash effects. The cameras new design also increases flash coverage to support lenses as wide as 18mm. Sensitivity can be set between ISO 200 to 1600 or controlled automatically (AUTO ISO) across the same range of settings to maximise the available light. 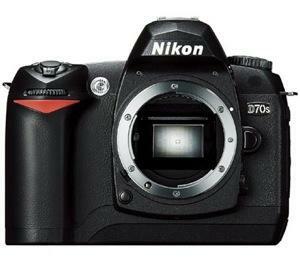 The D70s employs the Nikon DX Format sensor and Nikon F lens mount design shared by all Nikon SLR cameras for compatibility with AF Nikkor lenses, as well as the expanding range of high quality DX Nikkor lenses. The cameras 5-area autofocus system continues to feature a cross-type sensor in the centre, broad frame coverage, and class-leading low light detection which is improved to deliver greater precision with fast, more consistent subject acquisition and improved focus tracking. The D70s also has an AF-assist illuminator to help maximise performance when shooting in low lighting conditions. The D70s' advanced System LSI processor produces vivid colours and clarity, whilst maximizing the speed of file compression, memory buffer handling, simultaneous recording of JPEG and NEF (Nikon Electronic Format) files, and near-instant LCD image display. Nikon's 3D Colour Matrix Metering with 1,005-pixel sensor delivers consistently accurate exposure automatically by measuring brightness, colour, contrast, selected focus area, and subject-to-camera distance information for each shot. It then references the results against an onboard database of 30,000 scenes from actual photography. Variable centre-weighted metering and a choice of five spot meters are available, as are exposure compensation, and auto exposure bracketing. The D70s produces natural colouration by matching white balance to the light source of the shot. Advanced Auto white balance is capable of handling most situations, although the flexible options include white balance bracketing, a choice of six specific manual settings with fine-tuning, as well as a preset option for using a gray or white object as a reference for white balance. Innovative shooting options simplify the photographic process, whether controlled manually or via advanced automatic operation. Of particular note are the seven automated Digital Vari-Program selections accessed from the mode dial for a combination of personal control and powerful automatic operation that helps achieve great results under complex shooting conditions. The high-energy rechargeable lithium-ion battery EN-EL3a delivers the power to shoot up to 2,500 images on a single charge. The D70s can also be powered by the EN-EL3 battery used by the Nikon D100 and D70, or by CR2 batteries when using the optional battery holder (MS-D70). The controls are positioned for easier access and smoother operation. Newly designed menus are presented clearly and in plain language on the large 2.0-inch LCD monitor, while intuitive help dialogs are available for on-the-spot reference. PLEASE NOTE: Image is for illustration only, the lens shown is not supplied.